Sit down and look at your backyard and start thinking: what could go wrong here? Think about everything that your kids might get into and start making a list of answers. It doesn’t matter how unlikely the hazard might be – from the most obvious risk (teens jumping from the roof into the pool – and they all think about it) to the most harmless looking trip hazard – list everything. Once you’ve come up with your list of answer to the “what could go wrong” questions – apply the following to help you decide what to do about them. Note: These next steps are vital. Please stay with me and do the work. 1. 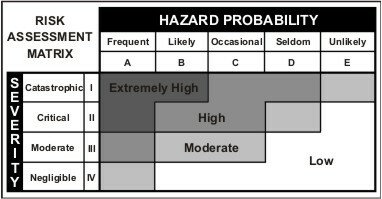 Given a particular hazard, determine the probability of occurrence and weigh it against the potential severity of the outcome. 2. If the risk is assessed as anything other than low – take steps to lower the probability or potential severity of the hazard. The probability of a child slipping and falling on wet concrete is moderate or “occasional” – bare feet are slippery when wet. The severity of that occurrence could be anything from moderate to “catastrophic” – they may just bruise their pride or they may hit skull-first on the concrete and fall – unconscious – into deep water. So the risk assessment for slip and fall is pretty high, isn’t it? As parents we can mitigate that risk in one of two ways: lower the severity or lower the probability. Lowering the severity in this case would be difficult, so we lower the probability by building pool decks that are slip resistant and implementing a “NO RUNNING” rule at our pool. The non-slip deck is a design control, and the “no running” is a behavioral control. Slip and fall risk mitigated – check. All of this may seem like a little too much explanation for what most of us call “common sense,” except that it obviously isn’t. Common sense was screaming at the manufacturers of hot tubs that single suction drains at the bottom of the tubs were dangerous. They missed it; not because they were bad people who didn’t care, but because they never asked the question and considered it. Repeat the process for all the hazards on your own list and your backyard will be a much safer place. List of things I consider when looking at backyard pool safety: Click for the downloadable PDF. …and don’t miss the videos from the Pool Safely campaign.